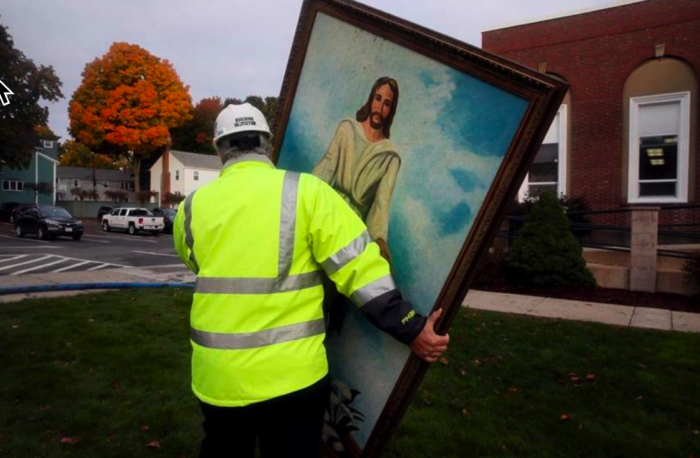 A lightning strike reportedly ignited a massive inferno Tuesday night at the 150-year-old First Baptist Church in Wakefield, Massachusetts, destroying almost everything inside — but amid the rubble, crews miraculously found one painting survived the hellish flames. A painting depicting Jesus Christ – standing in a white robe with hands, bearing the marks of crucifixion, extended – survived nearly untouched with only a few drops of water on it. The painting hung just inside the church’s front doors. The church building itself is a total loss, and the structure will have to be totally rebuilt if the church wants to continue to meet in that location in the future. But somehow this painting came through everything without any major problems. The First Baptist Church of Wakefield, which was nearly 150 years old, according to its website, caught fire around 7 p.m. on Tuesday, CBS Boston reports. A witness says lightning struck the 180-foot steeple before it went up in flames. “I saw the lightning strike the steeple, and we saw the smoke and it just went up in flames fast,” said Christian Bruno, who lives across from the church. The blaze was so intense that three of the firefighters that responded to the fire suffered non-life threatening injuries. Members of the church are hoping to meet this weekend either in front of the remains of the burnt structure or at another church. And even though this is a great tragedy, many have had their faith renewed by a miracle that has made national headlines all around the country. Next articleWhere Does The Tradition Of Wearing Halloween Costumes Come From?